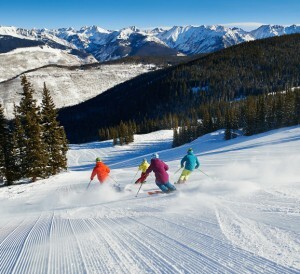 Looking to explore Vail Mountain this winter? Here’s our list trails – some historic, some just crowd favorites – that top long time Vail skier and rider must-do lists season after season. 10. ▉ Dealer’s Choice – a great introductory run to Vail, this run begins with an easy cruise down Lost Boy in Game Creek Bowl. Take in the views of Mount of the Holy Cross before veering right onto wide expanse of Dealer’s Choice. Don’t get too cozy – about 3/4 of the way down the trail there’s a steeper section that feeds into the line for Game Creek Chair (#7). 9. ▉ Born Free – a long green to blue run that begins at Eagle’s Nest and ends at the Lionshead base area and Eagle Bahn Gondola. 8. ♦ Look Ma – the former site of the World Cup Mogul Tour and a great chance to show off your bump skills to all of Mid-Vail. 7. ♦ Avanti – a classic front side run that starts out as a fairly mellow and fun groomed run with a fun, steep pitch right in the middle. 5. ▉ Poppyfields – the only groomed blue run in the Back Bowls, it’s your entree to Back Bowl skiing in Vail. Plus, you can’t beat the view. Once you’re at the bottom, take the catwalk back to the legendary Blue Sky Basin. 4. ▉ Big Rock Park – a beautiful, open glade in Blue Sky Basin where it’s easy to find a peaceful line all to yourself. While the natural groupings of trees and winding paths make it tough to take the same path twice, you won’t get lost since the run naturally funnels onto the path to Pete’s Express (#39). 3. ♦ Pepi’s Face – not only a well loved run for the ski races that once ended on this steep face, Pepi’s is a classic Hollywood Run because of its position in full view of the Gondola One lift line and the ever popular deck at Los Amigos Restaurant. 1. 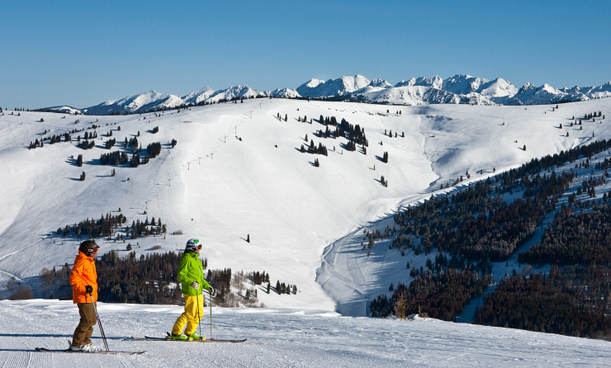 ♦ Riva Ridge – One of Vail’s original trails, it is still the longest single run on Vail Mountain at 4 miles. It was named by members of the 10th Mountain Division, many of whom were instrumental in founding Vail, for the decisive battle they fought in in the Italian Apennines during World War II. This steep run varies between blue and black pitches and provides gorgeous views. Keep an eye out for the steepest section, lovingly referred to as “Tourist Trap”.